Coleraine. 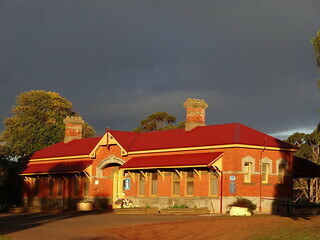 The old railway station now the Information Centre at dusk. Coleraine. Major Thomas Mitchell passed through here exploring in 1836 and it was because of his favourable reports the Edward Henty took up a squatting run just west of Coleraine in 1837. This was later converted to leasehold which Henty called Merino Downs. The main early homestead named Muntham was on a different run. Henty’s brother-in-law James Bryan squatted here too but his land was soon taken by an official lease by the Whyte brothers in 1846 for their run called Koroite. In time some of their lease was subdivided into smaller properties and in 1870 the rest of the run was resumed for closer settlement. Around 1850 a small settlement emerged called Bryans Creek Crossing, after James Bryan. This was later changed to Coleraine in 1853 when a government town was surveyed. The town grew slowly as the runs around it were so big until the 1880s and beyond. When selection acts were introduced in Victoria the wealthy pastoralists bought up their runs freehold. The Anglican Church opened in 1865, the Catholic Church 1888 and the Presbyterian 1892. Many of the large estates were not broken up until the 1910 closer settlement act and in 1923 when blocks were offered to soldier settlers.